Consumers today spend a lot of time making sure the food and beverages they buy are safe. Not only do they want to spend their money on high-quality, great-tasting juices, they want to be assured the products they are choosing for their families are safe to consume. Consumers want to feel confident products haven’t been tampered with after production. Protecting your juice bottles is a packaging decision which will pay off with increased profits. A very fast and effective way to show your customers you take food safety seriously is to use tamper-evident caps on your juice bottles. Tamper-evident caps provide quick evidence the juice inside the container hasn’t been tampered with during shipping or while on the shelf. Why Use Tamper Proof Measures? Tamper-evident caps are most common in the food and beverage industries, as well as the pharmaceutical market. They are effective at alerting producers and consumers of potential tampering. For safety, caps are designed with a secured ring attached to the cap by a thin bridge of plastic. When the cap is unscrewed from the container, the ring is broken and two pieces of the cap are apparent. If there is any sign the plastic has been broken, it is an indicator the cap has been tampered with and the product may not be safe to consume. Warning labels printed on the juice bottles alert customers to watch out for broken cap seals. There are several tamper evident technologies available at BottleStore.com that protect your juices, and to also add a little something extra to your bottle design. We offer a large selection of tamper evident closures in a variety of colors to compliment your design and add a pop of color. Banded caps are available with smooth sides or ribbed sides for added texture. Our banded caps come in nine different colors like red, purple, pink, and red. Different color tamper evident caps can be used to distinguish between different flavors or types of juices, while also protecting the product inside. Tamper evident caps, like our Top Drop Band Plug Seal, make protecting your juices easy. Caps can be screwed on by hand without a need for special equipment. This not only saves money, it saves production time and eliminates the need for tamper evident bands. Consumers do not need any special tools to remove the caps outside of a good grip. At BottleStore.com, we offer high-quality, tamper evident caps and closures to ensure the protection of your juice bottles. We have an inventory of tamper evident caps with guaranteed seal integrity. Choose a cap color to compliment your bottle’s design or utilize multiple colors to indicate multiple juice flavors. Many beverage brands are now easily identified by cap color by brand loyalists. Consumers can readily choose a certain juice flavor or specialty (i.e. Diet, sugar-free, organic) based solely on cap color. 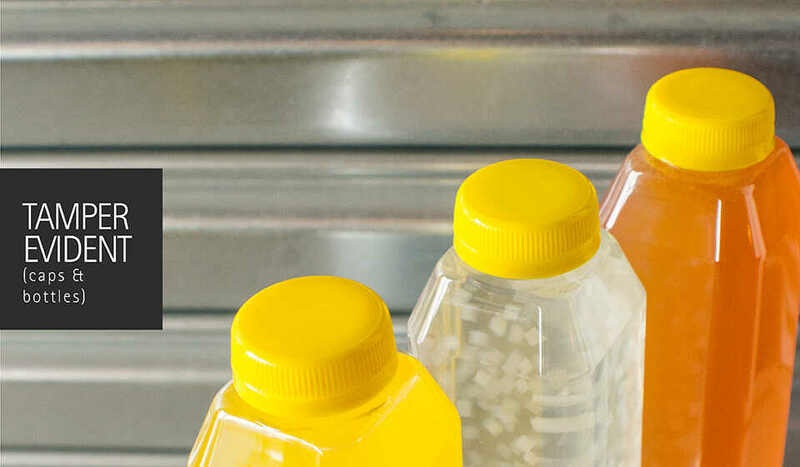 When choosing your glass or plastic juice bottles, ask about our full-service packaging solutions, including our selection of tamper evident caps and closures. Cap sizes will differ with your choice of bottle. Our BottleStore.com team can help you choose the right cap size for your desired bottle to ensure there are no issues with the production of your juices.